The Ski-Dart is a twin Jetex 50-powered free flight model that is patterned after the Convair (maker of the F-106 Delta Dart) Sea Dart. Simple balsa sheet construction is used and the only type of finish is using permanent markers for drawing panel lines, control surface outlines, canopy, etc. Unfortunately, there are no Jetex or similar (e.g., Rapier) motors or fuel being produced anymore, so you will either need to find one on eBay, or possibly use the 1/4A size mini Estes engines. 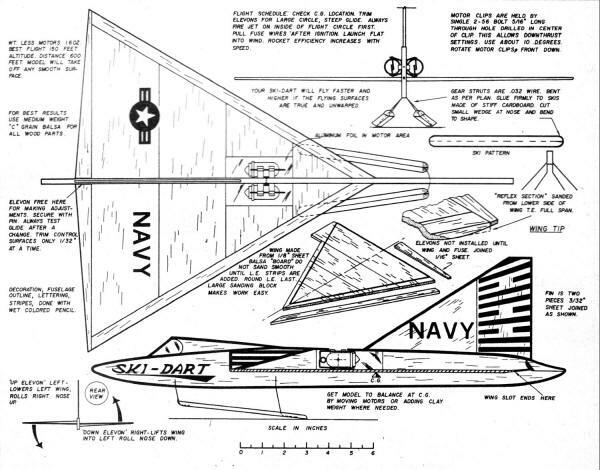 Convair's experimental Sea Dart was probably the most unusual seaplane ever to ROW. Your twin jet model, the Ski-Dart, is a going machine. There is exciting realism in the long takeoff run .... the sudden dip earthward as the lift breaks down (a basic characteristic of delta wings due to a flow transition, even on full scale aircraft) ... a bounce back into the air, both jets blasting ... Fast low-angle climb to altitudes of 100' ... smooth flare-over as power dies ... a fighter-like glide to the far end of the field. This is an easy model to construct. First digest the plans thoroughly. Make wing board a bit oversized; do not layout on wax paper; put glue on both edges of three-inch sheets to be joined; stick together in midair; lay on flat workbench and rub in glue at joint; let dry about 3 minutes. Wiggle loose and turn over; add small amount of glue and rub in; let dry and then continue in same manner. When dry, draw delta wing shape and cut with a sharp razor blade, using a straight edge for accuracy. Add leading edge strips; taper completed wing to 1/16" thickness at tips; don't forget reflex section on lower trailing edge. Do all colored-pencil decoration before assembly; do not "paint" a flying model. 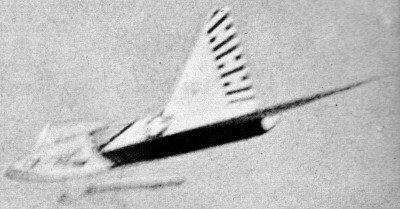 The skis and struts, as a completed unit, are cemented into slots in fuselage; double coat with glue. Flying is easy if care is taken. Get a straight glide or a very large circle. The ship will probably have a tendency to turn in one direction when thrown hard on a hand glide. Note this high-speed turning, then always light up the motor that is on the inside of that circle first. Thrust forces act about the C.G. and this little trick will keep your model in a safe flight pattern. If you pull fuse wires when the charges ignite (to prevent backfiring and loss of power) wet your fingertips first! Your Ski-Dart will take off any surface it can skid on. 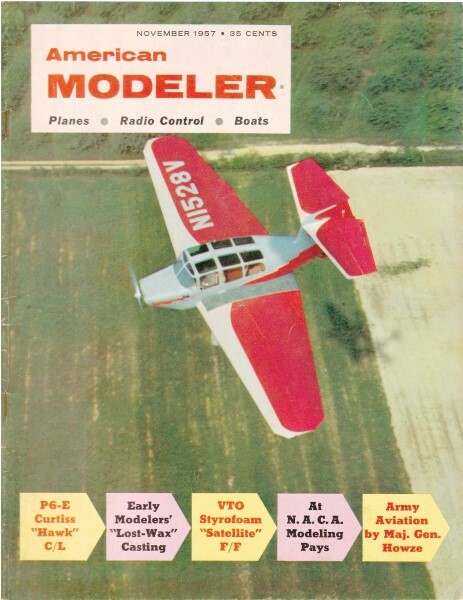 This model was designed oversize and heavy for easy flying. If you have success with this version, you might wish to try a lightweight ship using thinner and lighter balsa. But be careful - it's hot!